We all know this don't we. The difference between the U.S. old west and the Canadian old west is that in the U.S. the settlers went west first, then came law enforcement, such as it was at the time. In Canada the law (North West Mounted Police) went west first, established law and order, had the Indian treaties signed, and then the settlers came. If you work outside i'd say your nailing about 95% of the old west. Im pretty sure someones done that since 1895. Did someone actually pay him to write that nonsense??? I've always considered the "Old West" era to be from the end of the War between the States up to at least to 1912 when Arizona and New Mexico became states. It might be said it continued until WWI when a lot of rural people (mostly the men) traveled far from home for the first time to serve in the military and discovered the big wide world. Prior to that, at least in many rural areas there wasn't all that much difference between 1890 (generally accepted as still part of the Era) and 1910 to possibly as late as 1915. I'd concur with Dave T. My great-grandfather was born in 1902, western Michigan. Raised on a ranch in central Oregon and based on his stories ( he passed in 1994 from old age and inactivity with a clear head) I'd say that was correct. Aside from a train ride to Oregon as a tyke, his childhood was very much a continuation of the prior era, 1860-1890. No amenities on the hardscrabble subsistence ranch the family owned, his older brother broke wild horses and sold them , they cut cordwood and delivered it to the Willamette River boats for some scarce cash. The few photographs surviving show a lopsided roughsawn two-room house and pole barn covered in home-split shakes. My earliest memory of the man I was 4 years old, splitting shakes in the woodshed on a snowy day with a mallet and the froe he claimed was his fathers. Up into the 1980's he and grandma grew or traded for probably half of what food and other consumables they needed to live. Thrifty with themselves and generous with family and strangers alike, they have been a cherished memory for me, source of many stories my kids grew up hearing, and a connection I miss deeply to a simpler and more honorable time. I'd say to that Dave T pretty much 'hit it on the head'. I'd add that there different periods within that time but all interrelated. As a side note, my Dad born and raised in Iowa said that when he served aboard a ship during WW2 that several guys from the Boston/New York City area asked him if he/those in the Midwest still had problems with Indian raids and other problems related. I reckon I would go with the original definition - 1863 to 1893 ? the land rush for the cherokee strip was pretty much the end of free land . In 1883, Buffalo Bill's Wild West was founded in North Platte, Nebraska - when Buffalo Bill Cody turned his real life adventure into the first outdoor western show. This would mark of the end of the Wild West/Old West so beloved by dime novelists. Yes, cattle would still be driven, and outlaws roamed, as did Indians - but the railroad soon civilized the towns on the line and barbed wire did the rest. The Old West ceased to be the day they sold tickets to see it. The Time-Life series 'The Old West' does a good accounting of what really happened. "It Wasn't Cowboys and Ponies - It Was Horses and Men. It Wasn't Schoolboys and Ladies - It Was Cowtowns and Sin..."
Not trying to be argumentative but please explain this? Western/Frontier literature, both personal and researched histories, relate a great deal of "Old West" activity being a part of everyday life well after the date of that ticket sale. Sadly, we no longer have a frontier for our youth to go to very easily, if at all. Our only frontier is straight up! And, while this may be an oversimplification, I think it accounts for a lot of the problems our youth sometimes get into! Maybe, in twenty or thirty or fifty or a hundred years, access to the "Final Frontier" will be cheap enough to give them a "New West" to settle! 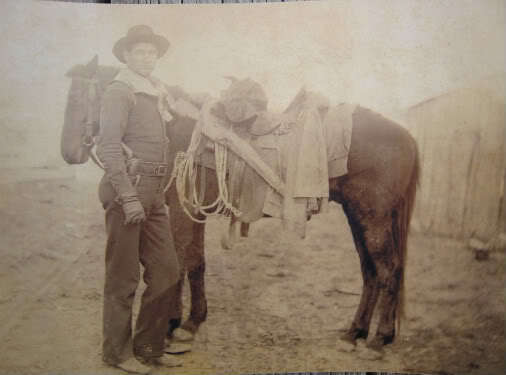 Although the US Census Department declared the frontier "closed" after the Oklahoma Land Rush of 1889, the Wild West lived on much later than that and the testimonies given by the other members here serve as good examples. It can arguably be said that the "Wild West" lives on today. Despite the current "snowflake" phenomenon, the values of rugged individualism, admiration of wide open spaces and personal property, private firearm ownership, the right to self-defense or making citizen's arrests, and a desire for disaster preparation are all still very evident. I've been fortunate to visit and work in many countries around the world but that "Wild West" or "Cowboy" - "Can-do" mentality is very American and it makes us stand out like sore thumbs... but in a good way. I would probably rephrase it at the period of the "American West" which started off with the Lewis and Clark expedition to continue through what is known as the "Expansionist Era" that lasted to right up to the beginning of the American Civil War. This would include the Mountain Man, Westward Movement, California Gold Rush, & Sierra Nevada gold/silver rush. Following the American Civil War, a succession of westward land rushes continued incrementally right up into the 1950s. My friends and I still to this day are "horse-people" with guns at the ready and hospitable hearts for those in need. So from where I sit, it aint over yet. However, if I were to call it the "Old West" for the sake of "wild woolly, heroes & outlaws" I would probably cite it from 1804 to about 1935. In either case, I don't know why the author failed to identify the 60-year period before the end of the Civil War and at least add that on to the years leading up to the 1890s. Good point. I should not have forgotten about our Australian cousins. I have only been to the Sydney area so that does not count. I have not yet seen the real Australia which still has a wide open howling wilderness. I will however tender the notion that the Wild West began long before 1865 as there were wild & rowdy mining camps and ol' California was a Helluva place where civilian "gunfighting" as we think of it today originated. It's true origin most likely was by soldiers issued Walkers in the conquest of Mexico who mopped up all resistance in Mexico City and the legendary (and controversial at the time) Texas Rangers in the war as well. I agree with Dave . The "Boonies" West of the Mississippi and East of the Sierra Nevadas remained "Old West" almost until WW2. In my mind, the three big game changers were the auto/truck, telephone, and electricity. town once a month until the end of the Great Depression. small scale hydro, or (the wealthy) used steam generator or an internal cimbustion generator. Some rural folks had a lamp and a radio run by battery, which was charged in the truck when it was driven. Heating and coooking was done with wood, keroscene and coal, lighting with candles and Hurricane and Aladin oil lamps. The Rural Electrification Act of 1936, enacted on May 20, 1936, provided federal loans for the installation of electrical distribution systems to serve isolated rural areas of the United States, Wiring homes and farms. A ceiling-mounted light fixture was installed in each room, usually controlled by a single switch mounted near a door. At most, one outlet was installed per room, since plug-connected appliances were expensive and uncommon. Wiring was performed using type NM (nonmetallic sheathed cable), insulated with asbestos-reinforced rubber covered with jute and tar. several miles from the power pole was just too costly. I got a lot of my foundation knowledge on life in the 1800s from My grandparents who grew up in 1880s era houses without electricity or running water out in Chelsea and Claremore during the 1920-30s. My grandpa always cited what a big deal it was when his house was finally connected to the line from the local gasworks. My uncle Clyde was childhood playmates with Pretty Boy Floyd, while my uncle Kermin Bradshaw got wounded while robbing a bank with his brothers in the Cookson Hills. My great cousin ran a man down with her Ford while making a bootlegging run, while another uncle was an affiliate of Bonnie Parker and Clyde Barrow but my grandma and aunt Coot did not like saying too much about "those two". I never considered myself a failure...I started out at the bottom and happen to like it here! That's a great story, sir! Is this "Kirk" your namesake?